Approximate Cost: 155 477 .00 GBP. The first major success of Breguet’s career came when he became the first to discover a formula which would produce a reliable automatic watch (one which would wind itself without the aid of a key or any other external source). In 1780, Breguet started producing his perpétuelles watches commercially, selling among the first examples to the Duke of Orléans, cousin of King Louis XVI, and to Queen Marie-Antoinette. The tourbillon is a device once used to eliminate the effects of gravity on the rate of a watch. A watch balance will go fast or slow depending on the position of the watch. Breguet got around this problem by rotating the entire balance and escapement about their common axis once a minute. The constant rotation averages out all the positional errors. A.-L. Breguet received a patent from France’s ministry of the interior for a new regulating device known as The Tourbillon on 1801-06-26. The first true wristwatch (that is, conceived from the outset to be worn on the wrist) was created in the Breguet workshops in response to a commission from the Queen of Naples dated 1810-06-08. Breguet watch no. 2639 took two years and a half to complete. 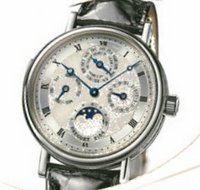 Note the delicate milling around the case, the world-famous blued steel hands with tips in the form of a hollowed-out apple, known as ‘Breguet hands’ or pomme Breguet, the elegant penmanship of the ‘Breguet numerals’, and each watch has an individual number and secret signature of authenticity. This entry was posted on Tuesday, January 10th, 2006 at 20:47 and is filed under Design Specials, Wristwatches. You can follow any responses to this entry through the RSS 2.0 feed. You can leave a response, or trackback from your own site. 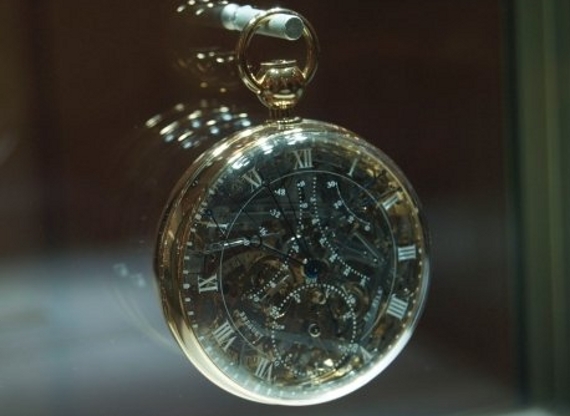 This watch was originally designed by Breguet himself and has more pieces (823) than an iPhone. It’s self winding, has a minute repeater, perpetual calendar, equation of time, jumping hour, power reserve indicator, and a bimetallic thermometer – everything but MMS messaging. It took forty-four years for the original to be constructed and Breguet and Marie Antoinette both died before it was completed. Ultimately, the original watch disappeared, never to be seen again. When Swatch acquired Breguet, an Indiana Jones style quest for the watch began. When they came up short they reproduced the watch using only the images of the original. Breguet has received offers in the eight digit range, but still refuse to sell.